Even with the Atlantic Antic, Brooklyn's biggest street fair, closing Atlantic Avenue west of Fourth Avenue until 7 pm yesterday, traffic flowed well on Flatbush Avenue next to the Barclays Center before the 8 pm show by Jay-Z, his third straight sell-out performance. As shown in a video below, shot from the intersection of Flatbush and Pacific Street, the key to traffic flow is a cluster of pedestrian managers--more like traffic managers--and traffic agents/cops who steadily waved northbound and southbound traffic through red lights. That extended the time available for Flatbush flow, and cut down the crossing time for pedestrians, many of whom understandably assumed that a green light meant go. Such an override is manageable only with such additional staff, and that's not a permanent feature of the arena. So check back in a few months. the low use of the surface parking lot meant less impact on residential Dean St.
As seen in the video, traffic managers waved Flatbush Avenue traffic through lights, leaving less time for pedestrians to cross, and for vehicles to turn from Pacific Street onto Flatbush. Atlantic Avenue was again closed in response to the huge flow of event-goers from the Atlantic Avenue arena exit, which is located west of Sixth Avenue in the middle of the block, without any corresponding crosswalk. Police officials began shutting down westbound traffic at about 11 pm, several minutes before the concert ended, sending vehicles north on South Portland Avenue or south on Sixth Avenue. A few minutes later, they shut down eastbound traffic, though not until a few minutes into the beginning of the video below. Two nights ago, I measured the shutdown at 12 minutes; last night, I instead walked with the crowd toward Atlantic Terminal and the Long Island Rail Road station, passing numerous vendors and seeing many attendees keep walking into Fort Greene. The video begins just after 11 pm. Before the arena opened, there were concerns that streets might be closed for security reasons, as in Newark, outside the Prudential Center. Officials vowed that wouldn't happen. Police/fire staging area on Pacific Street east of 6th Ave.
“As of right now, there’s no intent of changing traffic patterns,” Ameri replied. Clearly, that intent has changed. Stay tuned to hear arguments for a new crosswalk to accommodate arena patrons. Closing Atlantic will remain a challenge when there are weekend afternoon events. Also, for the first time in three nights, multiple residents in blocks immediately east and west of the arena reported feeling the booming bass from the concert inside their apartments--an unnerving observation confirmed by a walk outside. I was with some people standing on Sixth Avenue a few doors below Dean Street and we could hear/feel it. It was as if the Barclays Center is just a huge nightclub--or a massive SUV parked at the corner--with a souped-up sound system and imperfect noise protection. See report on Atlantic Yards Watch, which states, "Samuel Pierre, Brooklyn Borough Director, Office of the Mayor, also heard the music Sunday morning when he was attending services @ a nearby church." More than ten people logged complaints at night, including one who stated, "We can clearly hear the concerts from our apartment, even with the windows closed. I don't understand how this is even possible. Is anyone else experiencing this?" The boom was also palpable during a morning sound check, as shown in the video below. The surface parking lot associated with the arena, bounded by Carlton and Vanderbilt avenues and Dean and Pacific streets was again empty, perhaps 10-15% full, as shown in the video below, shot at about 8:15 pm. An unscientific survey of several dozen people waiting on line for the concert revealed that most took transit, some got driven, and a small but not insignificant fraction did drive. Few of the latter were willing to pay for parking, and they were willing to park not so nearby--as far away as DeKalb Avenue to the north and Grand Army Plaza to the south. The surface parking lot costs $25.65 prepaid (more for drive-up) and is limited to HOV (high-occupancy vehicle) parking, with three or more passengers. There are also 150 free spots for VIPs. Then again, some people are buying the allotted spaces in the prepaid service of ClickandPark. Fr tonight's show, for example, three lots are sold out (nearby 700 Pacific Street, $41.04 with service charge; 253 Ashland, $20.52; and 62 Rockwell, $20.52). Atlantic Ave. east of Sixth Ave. This doesn't mean there are no spaces; it may be that they've just sold out the spots they allotted for prepayment. 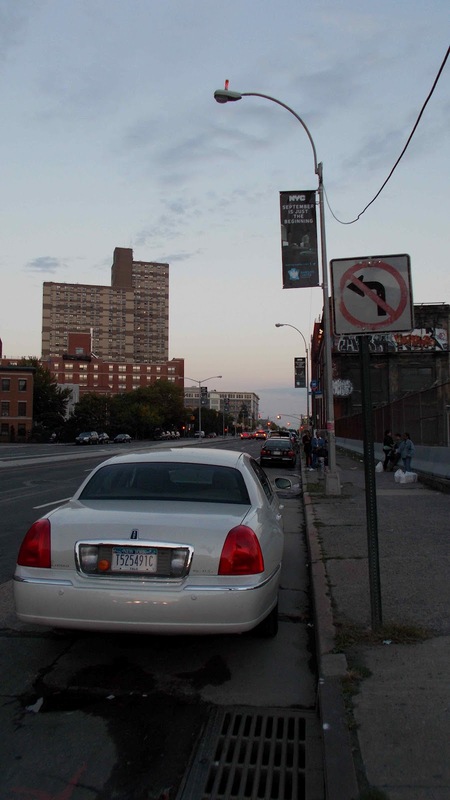 There's also illegal parking and standing, as shown in photo at left, at South Portland Avenue just north of Atlantic Avenue, or at right, a livery car on Atlantic Avenue east of Sixth Avenue. Traffic officer in intersection the entire time. I asked the officer to take action after about ten minutes (I returned after initial sighting) and office said he would, but was quite surprised at the request. Likely the cost of parking and availability/promotion of transit are the biggest reasons people took public transit. On Friday night, the fact that many people were coming from work was clearly a factor. But roughly similar numbers avoided paid parking--and, presumably, a took transit--on the weekends. Presumably an audience for Jay-Z, predominantly younger adults, is more likely to take transit than the older audience for Barbra Streisand or families going to Nets games--though, by then, they may have gotten the word to use transit. One semi-fanciful explanation I also heard was that a not insignificant number of Jay-Z attendees were getting high and uninteresting in driving while baked. That's not without plausibility; much pot-smoking was reported at the first concert. Walking around last night before the concert, I spotted people smoking pot on Pacific Street west of the arena and South Portland Avenue north of the arena. The line waiting to get into the building, about 6:50 pm. At Atlantic Avenue and South Portland Avenue, 7:38 pm, then crossing the street to the Atlantic Avenue entrance. At about 2:50 of the video, people cross Atlantic Avenue mid-block. The crowd at the Dean Street entrance, 8:06 pm, stretching to the sidewalk. The bicycle race, with about a dozen bikes, 8:07 pm. Some of these, I heard, are for arena workers.